This FourTwenty black Saxo Bubbler is a beautiful piece of glass art intended for oil lovers! It is made of a robust heat resistant borosilicate glass, formed in the shape of a scientific tube. A diffuser percolator bubbles up your smoke, cooling this way your toke, and a splashguard in slits prevents water from splashing into your mouth. The built-in diffuser ends up in a sure ground of 18.8mm diameter, connecting to a vapor dome and a nail for concentrating your oil. 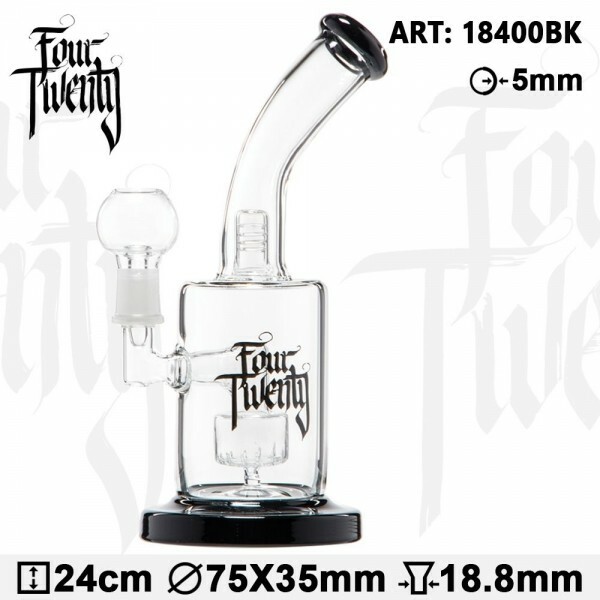 With the FourTwenty logo featuring at the front of the main chamber, the whole set-up ends up in a slide mouthpiece ring through a bending neck that will give you a funny sense of smoking in addition to a comfortable grip.